A republican event in Londonderry has erected a sign seemingly mocking the atrocious murder of British soldier and hero, Lee Rigby. Sinn Fein, SDLP and Alliance have remained silent in relation to the republican hatefest in Londonderry, which last night seen innocent residents and the PSNI come under attack by a masked republican mob. This stands in stark contrast to their daily condemnation of every aspect of Unionist culture. Sinn Fein were today behind an Irish Language protest at Hillsborough. 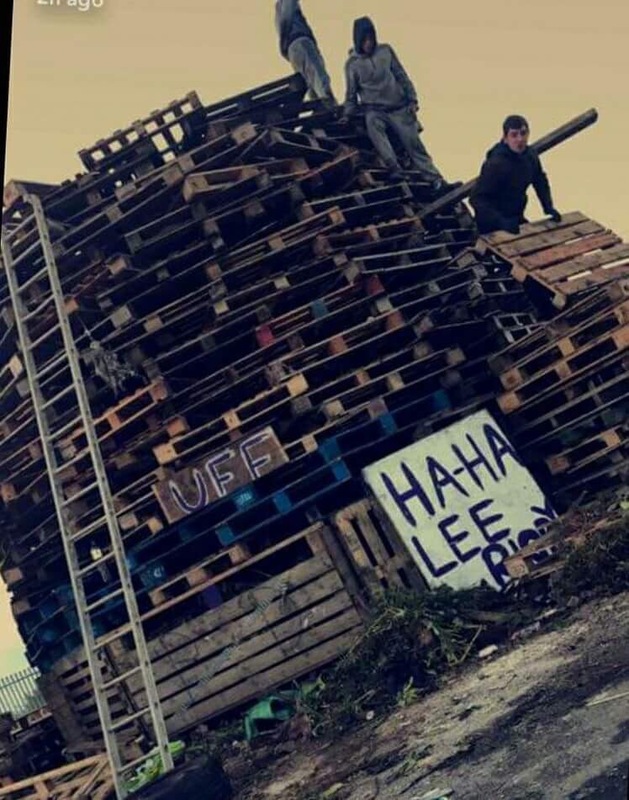 The protest, which was designed to manipulate the news agenda away from republican violence in Londonderry and other Sinn Fein controlled areas, targeted the Secretary of Stafe- despite the matter being devolved. In a further attempt to clog the news agenda, Irish Language activists claimed that the failure of Unionism to capitulate to their political demands had left a vacumn of paramilitaries. This despite the fact that an independent panel found in 2015 that Sinn Fein are controlled by the still active and illegal terrorist organisation, the Irish Republicna Army. 85 Responses to "NEWS: Republican event in Londonderry mocks death of British Soldier Lee Rigby "
I just like the helpful information you supply to your articles. I will bookmark your weblog and take a look at once more right here regularly. I am slightly certain I’ll be told many new stuff proper right here! Good luck for the following! Awesome website you have here but I was wanting to know if you knew of any user discussion forums that cover the same topics talked about here? I’d really love to be a part of online community where I can get advice from other experienced individuals that share the same interest. If you have any recommendations, please let me know. Appreciate it! I’m really loving the theme/design of your blog. Do you ever run into any internet browser compatibility problems? A handful of my blog readers have complained about my blog not operating correctly in Explorer but looks great in Firefox. Do you have any recommendations to help fix this issue? Nice post. I be taught something more challenging on completely different blogs everyday. It should always be stimulating to learn content material from other writers and follow just a little something from their store. I’d desire to make use of some with the content material on my weblog whether you don’t mind. Natually I’ll give you a hyperlink on your internet blog. Thanks for sharing. There are certainly a number of details like that to take into consideration. That could be a great level to deliver up. I offer the ideas above as normal inspiration however clearly there are questions just like the one you carry up where a very powerful factor can be working in honest good faith. I don?t know if finest practices have emerged round issues like that, but I’m positive that your job is clearly identified as a fair game. Both girls and boys feel the impression of just a second’s pleasure, for the remainder of their lives. A lot of of what you claim is astonishingly precise and that makes me ponder why I hadn’t looked at this with this light before. This particular article really did switch the light on for me as far as this particular topic goes. Nonetheless there is actually one particular position I am not really too cozy with and while I try to reconcile that with the core idea of the point, let me observe what the rest of the visitors have to point out.Nicely done. Thanks a lot for sharing this with all of us you actually realize what you are talking about! Bookmarked. Please additionally visit my website =). We will have a link alternate agreement between us! You need to take part in a contest for one of the best blogs on the web. I’ll recommend this site! Hiya, I am really glad I have found this info. Nowadays bloggers publish only about gossips and internet and this is really irritating. A good web site with exciting content, that is what I need. Thank you for keeping this site, I’ll be visiting it. Do you do newsletters? Can’t find it. Hey there would you mind stating which blog platform you’re using? I’m looking to start my own blog in the near future but I’m having a tough time deciding between BlogEngine/Wordpress/B2evolution and Drupal. The reason I ask is because your design seems different then most blogs and I’m looking for something completely unique. P.S Sorry for getting off-topic but I had to ask! I like the helpful info you provide to your articles. I’ll bookmark your blog and test once more here regularly. I am moderately sure I will be told plenty of new stuff proper here! Best of luck for the next! The camera work heightens this loss of individuality by filming everyone from the back or side whenever there is action, so close you can’t tell who is doing what, or were in relation to other people they are doing anything with. Thanks for another informative blog. Where else could I get that type of information written in such a perfect way? I’ve a project that I am just now working on, and I have been on the look out for such info. My husband and i were ecstatic that John managed to complete his investigation via the precious recommendations he made from your own site. It’s not at all simplistic to simply always be making a gift of key points which often many people may have been selling. And now we keep in mind we have you to be grateful to for this. These illustrations you’ve made, the simple blog navigation, the friendships you help to promote – it’s got everything fabulous, and it is assisting our son and us understand that concept is thrilling, and that’s highly vital. Many thanks for all the pieces! Hello, i think that i noticed you visited my site so i got here to “return the choose”.I’m attempting to find things to improve my web site!I assume its adequate to make use of a few of your concepts!! Aw, this was a really nice post. In thought I want to put in writing like this additionally – taking time and precise effort to make an excellent article… but what can I say… I procrastinate alot and under no circumstances seem to get one thing done. Hello there, You have done an incredible job. I will certainly digg it and for my part suggest to my friends. I am confident they will be benefited from this website. Hello! I just would like to give an enormous thumbs up for the great info you have got right here on this post. I shall be coming again to your blog for more soon. Fine way of describing, and fastidious article to obtain data regarding my presentation subject, which i am going to convey in academy. Excellent website you have here but I was wondering if you knew of any message boards that cover the same topics discussed in this article? I’d really like to be a part of online community where I can get feed-back from other experienced people that share the same interest. If you have any recommendations, please let me know. Appreciate it! Nice post. I study something more difficult on different blogs everyday. It can all the time be stimulating to learn content material from other writers and observe a little bit one thing from their store. I’d want to use some with the content on my blog whether you don’t mind. Natually I’ll provide you with a link in your net blog. Thanks for sharing. Have you ever considered writing an e-book or guest authoring on other sites? I have a blog based upon on the same topics you discuss and would love to have you share some stories/information. I know my audience would appreciate your work. If you’re even remotely interested, feel free to shoot me an email. I want to get across my admiration for your generosity in support of individuals who really want help with your concern. Your very own dedication to getting the solution all around has been remarkably functional and have surely allowed those just like me to arrive at their ambitions. Your personal insightful instruction denotes much a person like me and somewhat more to my fellow workers. With thanks; from all of us. Thanks on your marvelous posting! I definitely enjoyed reading it, you will be a great author.I will make certain to bookmark your blog and may come back down the road. I want to encourage yourself to continue your great writing, have a nice holiday weekend! Greetings! Very useful advice in this particular article! It’s the little changes which will make the most important changes. Thanks a lot for sharing!